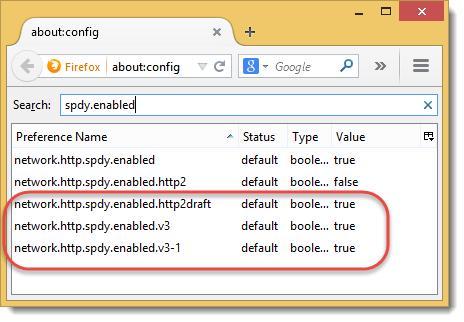 Firefox 35 was released this week and became the first browser to enable support for the HTTP/2 protocol by default. The HTTP/2 specification has not been finalised so Firefox actually enabled the Draft 14 version of HTTP/2 but little is expected to change in the final draft. Google is now supporting HTTP/2 draft 14 on its web servers alongside the SPDY protocol giving us a chance to compare the performance of raw HTTPS, SPDY and HTTP/2 on the same web page. Each test was performed in a fresh instance of Firefox with an empty browser cache. Although this testing was simplistic and only used a simple page it does highlight some important differences between the protocols. Most sites already use compression when downloading textual content as it provides a significant performance benefit. Unfortunately, HTTP/1.1 doesn’t support the compression of HTTP headers that are attached to every HTTP request and response. SPDY and subsequently HTTP/2 were designed to address this shortcoming using different types of compression. SPDY uses the general purpose DEFLATE algorithm whereas HTTP/2 uses HPACK that was specifically designed to compress headers. It uses predefined tokens, dynamic tables and Huffman compression. HTTP/2 has significantly smaller header sizes due to its use of the HPACK algorithm. The response message from the server is made up of the response headers and the encoded response content. Given the fact that HTTP/2 creates the smallest headers shouldn’t it always have the smallest response message? Padding isn’t used for image resources because they already have a compressed format that will not contain attacker controlled plain text. The larger response bodies seen on the Google servers are due to the use of padding in data frames. Although, HTTP/2 produces larger responses than SPDY its encrypted connections could potentially be more secure. This may be an area where tuning can be performed in a trade off between security and performance. 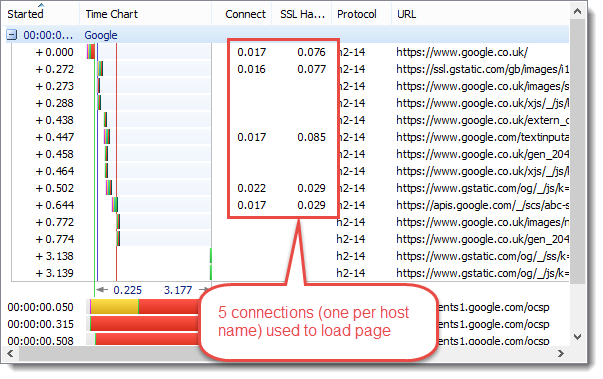 Browsers achieved a performance boost in HTTP/1.1 by increasing the maximum number of connections per host name from two to six or more. This allowed greater concurrency during the download of a page at the cost of extra TCP connections and SSL handshakes . Increasing concurrency allows the bandwidth of the network to be used more effectively because it reduces the blocking of requests. 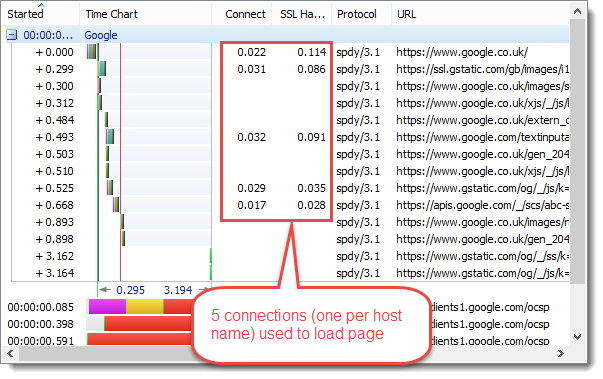 SPDY and HTTP/2 support concurrency on a single TCP and SSL connection by using multiplexing to allow more than one request at a time to send and receive data on a single connection. The multiplexing support added in SPDY and HTTP/2 reduces the number of connections that have to be setup to download a page. As a side benefit web servers will not have to maintain as many active TCP connections when HTTP/2 usage becomes more widespread. 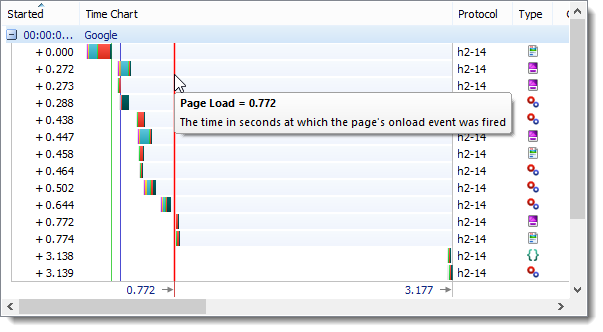 The ‘Page Load’ event in HttpWatch shows when the page was fully downloaded and available for use. 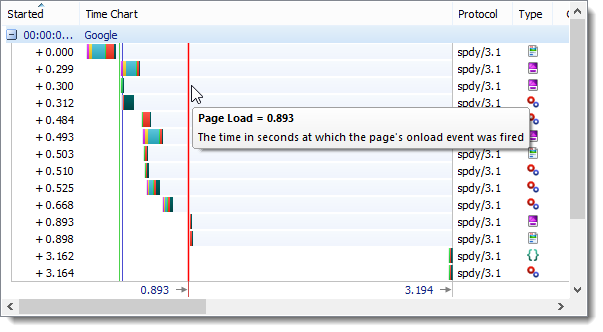 In most cases this a reasonable measure of the speed of the page as seen by a visitor to a web site. 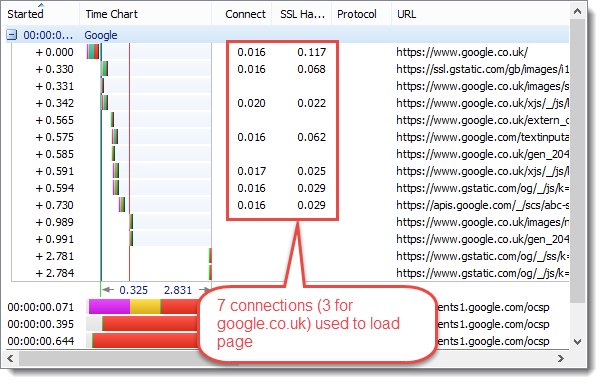 The Page Load timing was worse for raw HTTPS probably due to the lack of header compression and the additional TCP connections and SSL Handshakes required. 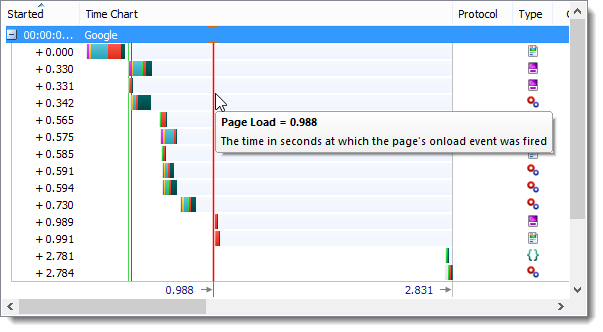 For more complex pages the speed advantage of SPDY and HTTP/2 should be even greater. We also found that HTTP/2 was consistently faster than SPDY even though its response messages were often larger. The advantage was probably due to the smaller GET request messages produced by HPACK compression. Our network connection to the internet, like many others, is asymmetric in nature – the network upload speed is less than the download speed. This means that any saving in uploaded data has much more impact than the equivalent saving in downloaded data. HTTP/2 is likely to provide significant performance advantages compared to raw HTTPS and even SPDY. However the use of padding in response messages is an area of potential concern where there could be a trade-off between performance and security. You can check for HTTP/2 using our new SSL test tool SSLRobot . It will also look for potential issues with the certificates and TLS/SSL configuration used by your site. Try it now for free! I would strongly recommend using jmeter or any other alternative in order to provide these conclusions. High number of samples will give you better results. Very interesting analysis. Many thanks. But for many website operators the question is not switching from HTTPS but from plain HTTP/1.1 to HTTP/2. Therefore, it would be really interesting to see a comparison for unencrypted HTTP/1.1 vs. encrypted HTTP/2. I’d perfer a comparison HTTP/1.1 VS unencrypted HTTP/2. It’s very unlikely that you’ll ever see unencrypted HTTP/2. The reason is that there is a lot of existing infrastructure (e.g. proxies, load balancers, firewalls) that would fail if it encountered HTTP/2 frames. The advantage of using HTTPS is that existing infrastructure will not be exposed to the new data format of HTTP/2. Also, the Firefox and Chrome teams have both indicated that they will only implement HTTP/2 over TLS (i.e. HTTPS) because of compatibility and security concerns. I think the savings shown are negligible. Most people have a Internet connection under 1mb/sec and the saving are under 1 sec. The HTTP application protocol is state-less, which means each client request must include as much information as the server needs to perform the desired operation. This mechanism causes the data streams to carry multiple repetitive frames of information such that the server itself does not have to store information from previous client requests.